Question: Can we get an egg to fall into the bottle? Hypothesis: We think that the change in air temperature and air pressure can make the egg fall into the bottle. 1. Light up to 3 matches and put them into the glass bottle. 2. Quickly put the egg on the bottle, narrow side down. 3. Watch as the egg is sucked into the bottle. Special Needs: We need a fire extinguisher just in case somebody drops a match!!!!!!!! 1. 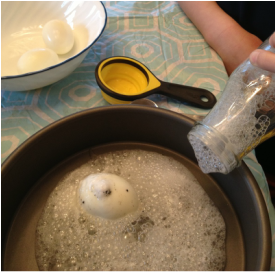 Pour one tablespoon baking soda and 1/4 cup vinegar into the bottle with the egg inside. 2. 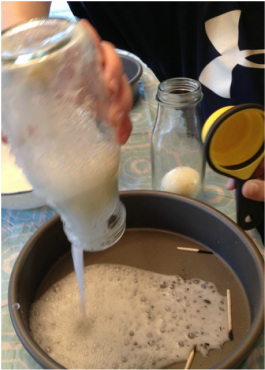 Flip the bottle over while the baking soda and vinegar is still inside the bottle. 3. Once the bottle is flipped over, the egg will fall out of the bottle. Matches: Strike it correctly make sure you don't drop it. Glass Bottle: If you drop it it can break and hurt you. When you put the match inside of the bottle the air heats up and expands. Then when you put the egg on the bottle the match will go out and the air temperature cools and contracts, therefore, creating a vacuum. Nature abhors a vacuum. Air will rush to fill the empty space. Pushing the egg to go in. Also the vacuum is sucking the egg into the bottle. 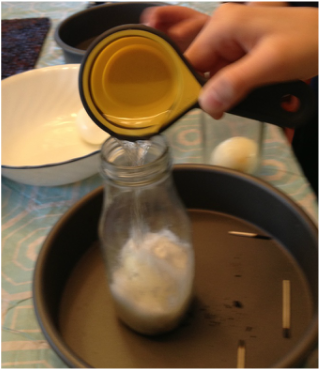 Then the egg ends up in the bottom of the bottle. When you try to use an egg right out of the fridge, the egg will not move an inch because the egg is not in room temperature. How can you get the egg out of the bottle...when you put the bottle upside down,the egg gets stuck at the mouth of the bottle and it doesn't look it will possibly come out. But if you put vinegar and baking soda together into the bottle, this will cause a chemical reaction to produce a gas, carbon dioxide to increase the air pressure inside of the bottle.So when you flip the bottle,the pressure pushes the egg out like magic. I am 10 years old and in 5th grade. I have 1 younger brother who is in 2nd grade. I love playing football, basketball and baseball. Most of all I like to play with my friends. And cards. I love playing cards. And video games. I love video games. I especially loved doing this project. It was fun to do. I am 10 years old and I have one younger brother in 4th grade. I love playing football, basketball and I enjoyed science night very much. If you entered science night I bet you would like it too!